For the 2nd week in a row I find myself in awe of the production and sound at a live show, this time with Massive Attack. The style in which the executed their show was an awesome experience. 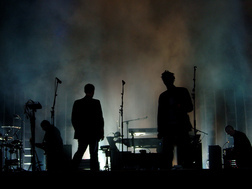 The ever dynamic ensemble of Massive Attack performed with any number between 2 and over 7 people on stage, yet the sound never seemed to be compromised. In full flight - double drums, brooding bass, ripping synth and guitar riffs, silky vocal melodies - and for all the layers, there still seemed to be space in their music. While so many other bands of their generation are washed out parodies of themselves, Massive Attack have kept their vision and resolve, and are still very much relevant today. Apart from musically hitting the mark, their show was well targetted. The weekly trash-filled headlines flashed across their backing screens, followed by more thought provoking political newslines, as if beckoning us to form our own opinions. Then, in a simply epic 8 minute version of ‘Safe From Harm’, inspirational quotes on freedom and current politics encouraging the audience to think for themselves. They are just about to release a new EP - ‘Splitting The Atom’, to precurse a new album arriving early next year. So steam on the Massive Attack Juggernaut - if you get a chance, go check them out - I was suprised how much I enjoyed this show. This entry was posted on Sunday, September 27th, 2009 at 11:09 pm	and is filed under Massive Attack, Electro. You can follow any responses to this entry through the RSS 2.0 feed. You can leave a response, or trackback from your own site. the track is called Unfinished Sympathy, not Safe From Harm.